Looking for some extra space to store your abundance of corny t-shirts and yoga pants? 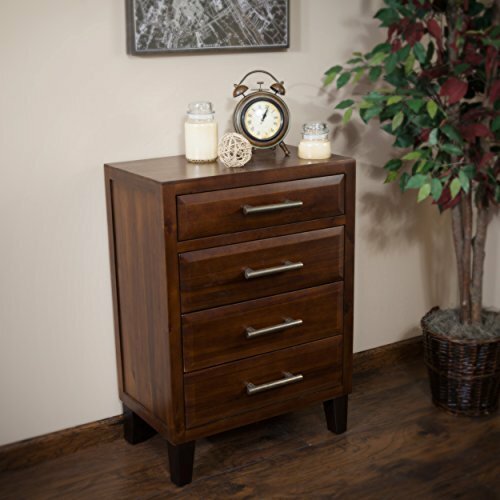 Check out this chest of drawers from the Shoal Creek collection. With four deep drawers that open and close on smooth metal runners, it will fulfill all your storage needs. Finished in a classic Jamocha Wood, this stylish dresser will knock your socks off! Is your kid's room small? 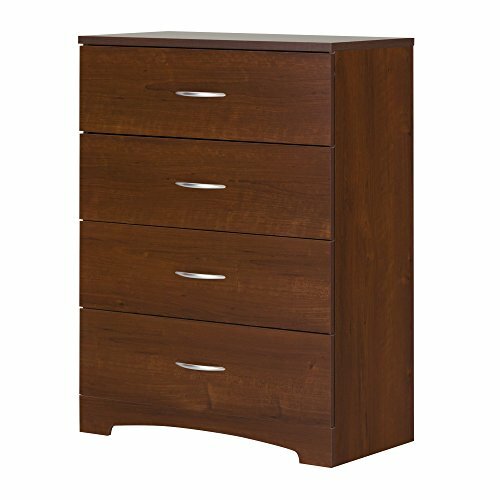 No worries: This contemporary style 4-drawer chest offers plenty of storage and was designed just for tighter spaces! The furniture lets you picture a simple decor that's brought to life through the use of bright colors. Let your imagination go wild, and see where it takes you! Elegant metal handles in an Pewter finish. Metal drawer slides. 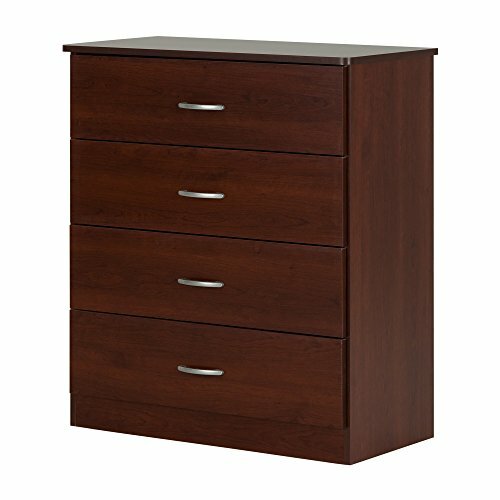 4 Pratical Drawers. Drawer dimensions #1: 27.125'' (L) x 13.625'' (D) x 4.375'' (H). Meets or exceeds all North American safety standards. Accessories not included. Requires complete assembly by 2 adults (tools not included). 29.75'' (W) x 19.5'' (D) x 34'' (H). Box dimensions: 40.59'' (L) x 20.196'' (W) x 6.85'' (H), 91 lb. Ships in a heavy box, make sure to have a friend with you. Packaging tested and certified to reduce the risk of damage during shipment. Made in North America with non-toxic laminated particleboard. 5-year quality guarantee. Any questions? Contact South Shore, the manufacturer, available 7/7 by phone, email or chat. 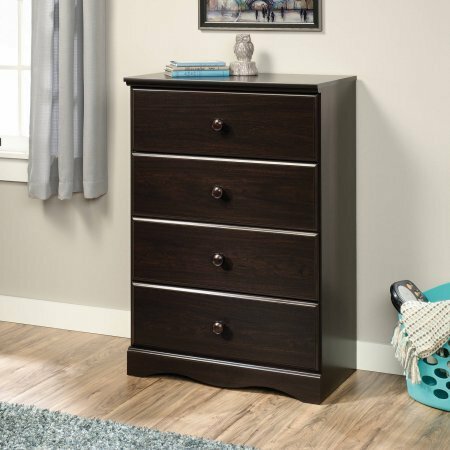 Thanks to its rich finish and timeless look, this 4-drawer chest features sleek lines and blends perfectly into today's trendiest decors! Elegant metal handles in a Brushed Nickel finish. Decorative kick plate and sleek lines for a contemporary style. Features 4 practical drawers. Metal drawer slides. Drawer dimensions #1: 29.5'' (L) x 13.625'' (D) x 4.375'' (H). Meets or exceeds all North American safety standards. Accessories not included. Requires complete assembly by 2 adults (tools not included). 32.87'' (W) x 18.87'' (D) x 34.87'' (H). Box dimensions: 41.85'' (L) x 19.48'' (W) x 7.99'' (H), 68 lb. Ships in a heavy box, make sure to have a friend with you. Packaging tested and certified to reduce the risk of damage during shipment. Made in North America with non-toxic laminated particleboard. 5-year quality guarantee. Any questions? Contact South Shore, the manufacturer, available 7/7 by phone, email or chat. 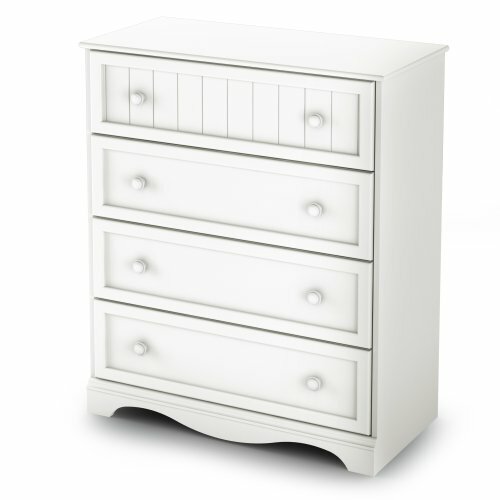 When looking for that perfect chest of drawers, you look for style and functionality. The Artisan Bedroom Chest of Drawers has both in spades. 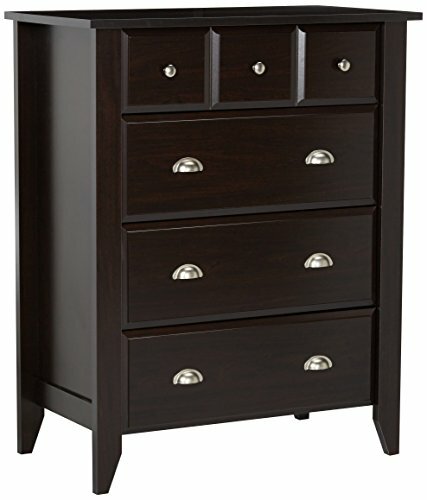 It comes with three deep drawers for large clothing articles and three smaller drawers for your smaller clothing items. 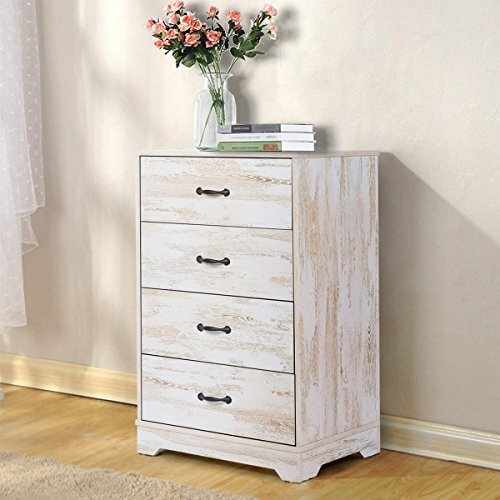 This unit has been designed to keep your bedroom clean, neat and organized. This item is hand-crafted and hand-finished with utmost care, as such variations and imperfections should be expected and should be welcomed as the natural beauty of the wood. You can never have enough storage in your life, right? 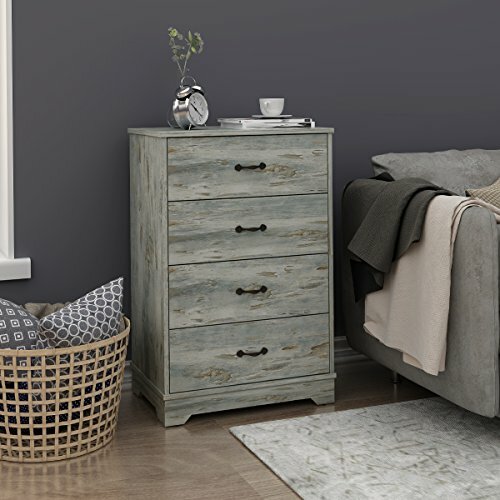 Why not add a little more with this chest of drawers from the Beginnings collection? Finished in Cinnamon Cherry, this dresser features four total drawers, with three lower large drawers and one smaller top drawer. It provides you with an ample amount of storage for your collection of college t-shirts and rad jeans. What’s not to love? Looking for some extra space to store your abundance of t-shirts? Check out this chest of drawers from the Sauder Storybook collection. With four deep drawers that open and close on smooth metal runners, there is plenty of room to hold not just clothes but blankets and toys too! 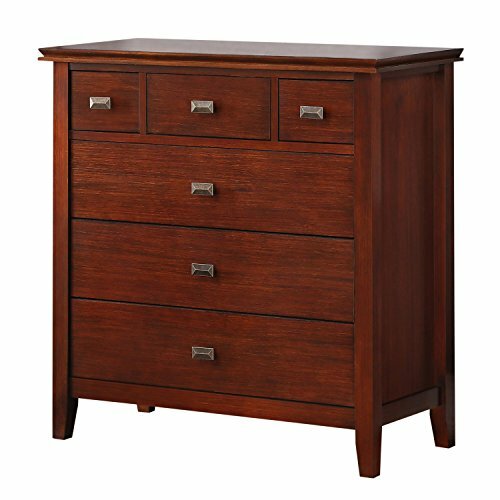 Finished in a classy Jamocha Wood, this chest will give any home a fresh new look. 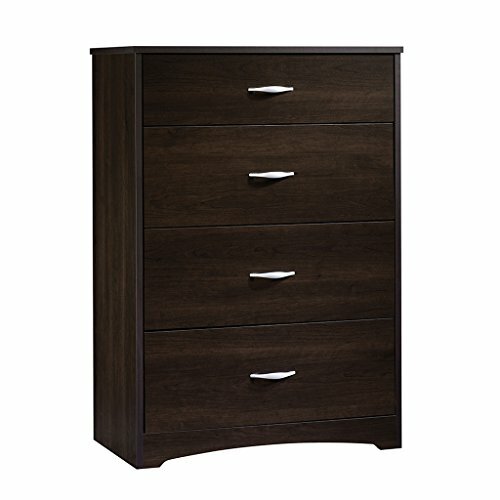 Copyright © Wholesalion.com 2019 - The Best Prices On Wood Chest 4 Drawer Dresser Online.